Eight Lunches, Second Draft, DONE! Going on a 30 day road trip, including speaking and to a conference, with my family, left me little/no time to write. I’ve been ramping up on the product and sales of a new product for university career centers, which has been very exciting. I’ve been training my dad as he’s been learning about JibberJobber, the new university career center system, and everything else that has to do with my work world. I have a number of other things going on, but one that I’m so excited to share is that I FINALLY got the second edition of Eight Lunches, my third book, DONE! On my Jason Alba blog I announced this project back in May of 2010, and asked if anyone wanted to critique the first draft. I thought I’d get like … well, no one. But 100 comments later, I found myself sending the book out to lots of amazing people. And then I started getting feedback. And it was literally overwhelming. The feedback was great, ranging from spelling/grammar to concept/flow. Getting that much feedback from that many people overwhelmed me to the point where I didn’t even know how to consume all the feedback, much less act on it. So it stalled, and I went on to other things. But this was always somewhere near the top of my mind, and I was anxious to get it done. The timing finally happened, and here we are, with the second edition done. I will crowdsource feedback again (I just made that decision this very second), but will only ask for a paragraph or two of thoughts… preferably critical/negative, which will help me tighten it up more. If you want a copy of this second draft, please leave a comment on this post. I’m excited to get this far… I now feel freed up to work on my fourth, and I think most exciting book… more on that later! Why Not? Five Kids, 50 Hours in a Van, We Actually Survived! We recently got back from the biggest road trip of our marriage. Initially we were going to drive to and from the reunion, and then I’d fly back to San Antonio, but the timing just wasn’t working out. 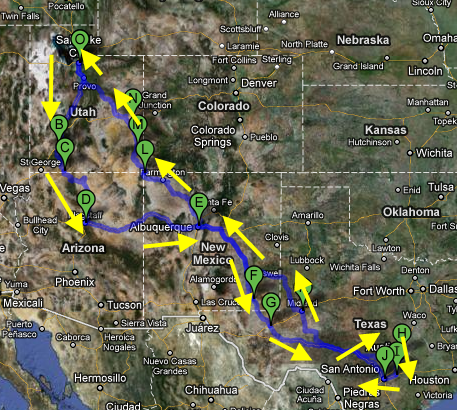 So we made a four week trip of it, which allowed me to speak a number of times while on the road (In Austin 3 times, San Antonio once, and Albuquerque once). It was… a trip! I appreciated all of the people I met who complemented me on doing this with my family, making memories, etc. There were lots of highs, a few lows, and tons of great memories. There are lots of reasons to not go on a trip like this. Money is a big one. Time is another. I took four weeks to do this, which I perhaps could have spent blogging, or writing, JibberJobbering. But there were better reasons to do it…. I want to make sure my kids have family memories they can lean on when they move out of the house, and this is how it’s done. I’m back now, though. I’m renewed from my vacation, even though I’ve found it hard to get back in my seat and work as long as I have before. Also, being away was refreshing… I had time to get “out of the forest” so I could see the trees… I’ve rededicated myself to some projects I’ve needed to finish, and am excited to move in the directions I’ve needed to. 1. You totally hit this product correctly. I have been doing job search for 40 years as a software developer, and you have captured exactly what needs to be tracked. I value good software, and it will be a big help in landing a job, so paying for 3 months of premium is well worth it. Very nice – I think the same thing but I’m pretty biased! It’s a real compliment to hear this from a software veteran! 2. The ability to maintain membership at free level after I get a job. Nice move, it really helps sell your business proposition. If I were the consumer, I would totally want this… and that’s why we did it. Our business needs to make money, of course, but it’s really all about YOU, the job seeker. I feel like not doing this would be disrespectful to you. 3. Good UI design. Easy to understand. Thank you I have a bunch of emails from people who disagree, but they probably have less time in front of a computer than you do. We do strive to clean our UI, though… any suggestions, we’ll take’em! Learn more about the upgrade here. Comments Off on JibberJobber: Why Upgrade?